A blog for Service 2.0 research project in Service Innovation & Design at Laurea University of Applied Sciences. 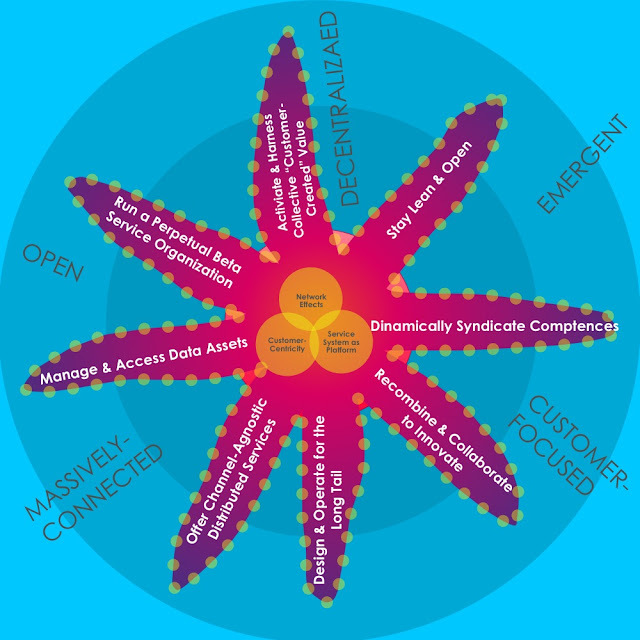 I envision agile, wiki, open, remixible, crowd-sourced and long-tail future services. Upon Analysis of Literature written on Web 2.0 mainly by O'Reilly, Musser and Shuen, I compiled the practices (you can still call them patterns or principles) of Web 2.0 in 8-armed starfish shape. I borrowed the starfish analogy from the book "The Starfish & The Spider: The Unstoppable Power of Leaderless organizations" which enforces the meaning of the shift that happened from the centralized Web 1.0 to the decentralized Web 2.0. I'll write further posts on this later. 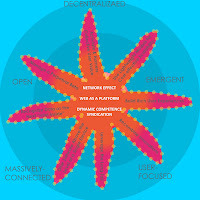 Based on Web 2.0 starfish, I prepared another starfish that represents the Web 2.0 principles in Service context. These principles serve as tentative and potential service 2.0 principles. 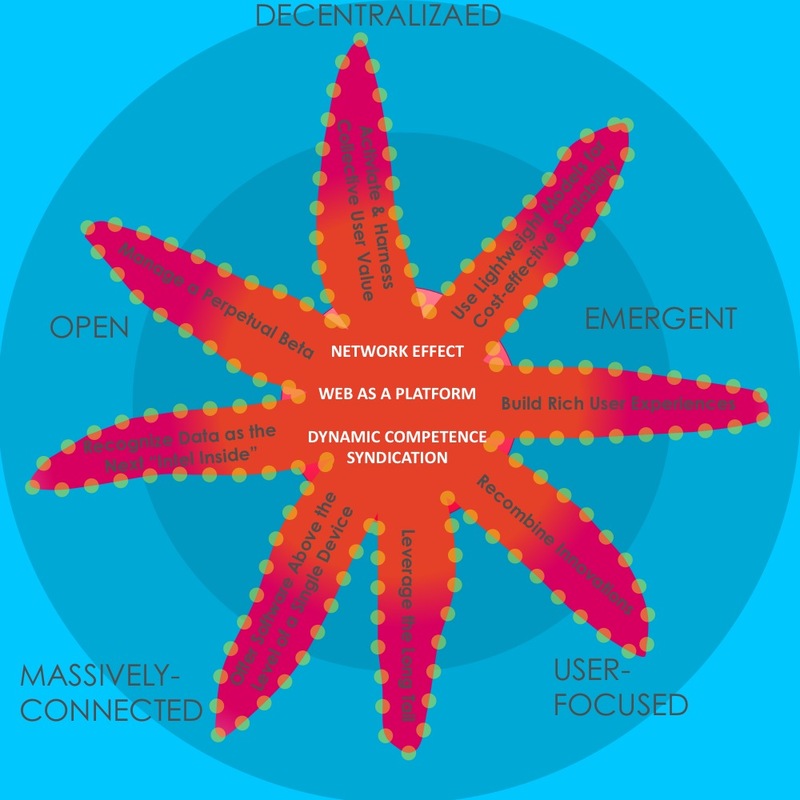 I've rearranged the principles, and shifted some of the principles of web 2.0 to the core of the starfish and moved some of the concepts from the core to the arms as per the differences between Web 2.0 and Service 2.0. Following is the final shape of the 8-armed Service 2.0 Starfish. Each of the arms represent a strategy (could also be called principle or pattern) and 3 main core concepts rest in the center. The principles were rephrased to be more service-research friendly yet will rely on the content offered at each principle of the Web 2.0 for the discussion. The objective of the discussion to follow the formation of these principles is to reach an understanding of how applicable these principles are for the service domain, what new concepts they could offer and what final list of concepts to select from for further discussion. The discussion will utilize the content offered at O’Reilly’s work, in addition to the related content to the main principles from Musser’s work and the main strategies and related content from Shuen’s work. Detailed practices, debates, benefits and misconceptions will later be discussed only for the selected concepts for the study to focus on. This principle combines the “Harnessing Collective Intelligence” principle of O’Reilly and Musser and “Users Create Value” strategic principle of Shuen. The principle was phrased to reflect this combination of the activation and harnessing of the collective value. The phrasing also used the term “customer” rather than “user” as this specification is not required in this case. The “customer-created value” as a term was used to specify the type of value addressed, as the term “customer value” alone could be understood as value to customer (from the service) or value from customer (to the service firm). This principle includes discussion of the topics related to user activity and participation , architecture of participation, folksonomy, viral marketing, open-source, wisdom of crowds, crowdsourcing, network value and intelligence, implied metadata and human-device hybrid intelligence, cognitive surplus and network effects. These concepts will be discussed in the light of the following corresponding concepts from the service and service marketing literature; co-creation, many-to-many marketing, service-dominant logic, mass collaboration, co-production, adoption. This principle is another more business generalist-friendly phrasing for “Lightweight Models for Cost-Effective Scalability”. The discussion of this topic will include the concepts of commoditization, reuse, business model syndication, outsource, scaling of pricing and revenue models, scale with demand, open business models, loose-coupling vs tight-coupling, Syndication vs. coordination, design for hackability and remixibility, network effects. These concepts will be discussed in the light of the following concepts from service and service marketing literature; business models, outsource, dynamic reconfiguration of talent, velcro organization, lean startup. This principle corresponds to Shuen’s strategic principle of “Dynamically Syndicate Competences”. This principle includes discussion of topics related to dynamic comptence syndication, SaaS, Mashups. These concepts will be discussed in the light of the following related service and service marketing concepts; Dynamic competence syndication, dynamic reconfiguration of talent, collaborative consumption, peer production and abundance. This principle combines the “Innovation in Assembly” principle of Musser, which was covered by O’Reilly under “Lightweight Programming Model” and “New Recombines with Old” innovation strategy of Shuen. These concepts will be discussed in the light of the following corresponding concepts from the service and service marketing literature; new service development, customer innovation, co-development, service systems, collaborative consumption, co-creation, co-production. This principle corresponds to Musser’s principle of “Leveraging the Long Tail” which is covered under O’Reilly’s principle of “The Web as Platform”. The principle is also addressed in more than a strategy of Shuen’s work. This principle includes discussion of topics related to long-tail, democratized production, democratized distribution, supply and demand, reputation systems and self-service. These concepts will be discussed in the light of the following related service and service marketing concepts; long-tail, democratized innovation, mass collaboration, mass customization, personalization and co-production. This principle corresponds to O'Reilly's and Musser’s principle of “Software Above the Level of a Single Device”. This principle includes discussion of topics related to pervasiveness, Design patterns for smarter network edge, seamless integration, location awareness. These concepts will be discussed in the light of the following related service and service marketing concepts; service systems, value networks, customer experience, experience network. This principle corresponds to “Data is the next ‘intel inside’” principle of O’Reilly and Musser. This principle includes discussion of topics related to data-specific strategies, data-centric business models, data-ownership and access, competition from software to data ownership. These concepts will be discussed in the light of the following related service and service marketing concepts; information availability, self-service. This principle corresponds to “End of Software Life Cycle” principle of O’Reilly and “Perpetual Beta” principle of Musser. This principle includes discussion of topics related to co-development, real-time monitoring, time to market, design patterns. These concepts will be discussed in the light of the following related service and service marketing concepts; agile service development, Gaps model of service quality. At the moment, I'm considering rearranging these keywords under different categories in a sort of affinity diagram. This may help read the relationships differently and come up with different set of principles which are more relevant for service needs. How do you see these principles and the areas that discussion will cover for each? Do you expect application of these principles to enable and unfold new possibilities in the service research and practice?